We are saddened to report that Tim Holden passed away on August 3, 2008 in Rochester, New York, at age 97. Tim worked for Graflex from 1935 until 1973. After retirement from Graflex, he worked at RIT. During his time at Graflex, he was responsible for many administrative functions, espe- cially the Photorecord units, for which he was completely responsible and very proud. 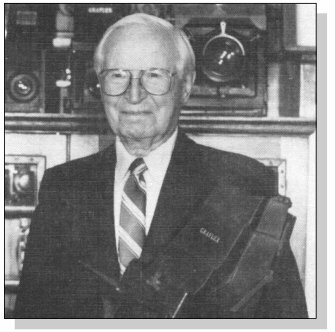 He was responsible for the accuracy of the Morgan and Lester Graphic Graflex Photography books and was most effective as the technical liaison between the public and Graflex. Tim had a remarkable memory and was supportive of all efforts to accurately tell the Graflex story. He contributed regularly to the Quarterly through his "Ask Tim Holden" column and with insightful articles. His knowledge, encouragement and kindness will be very much missed by those who knew him.